Foreigners have invaded China and the Boxer Rebellion has begun. The kung fu schools band together against their new enemy - the Gun. 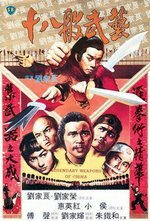 The head of the I-Ho Society Lei Kung (Liu Chia Liang) disbands his school, knowing that they're no match against the foreign weapons and goes into hiding as a woodcutter. Masters from other school send (2) hired killers after him to silence him because they want others to believe that kung fu practitioners are invincible against guns.